The exceptionally beautiful tidal lagoon of the Knysna National Lake Area, South Africa is surrounded by picturesque forests and mountains. The Knysna National Lake Area, South Africa is a tidal lagoon and open estuary dominated by the Knysna Heads, huge craggy sentinels which stand between the serene lake waters and the Indian Ocean. The nearby forests provide ample opportunity for leisurely walks or picnics, hikes or strenuous day walks as well as biking trails for cyclists. The Harkerville Forest in the Knysna National Lake Area is the end point for one of South Africa's most popular hiking trails, The Outeniqua Trail which is 7 days and 8 nights long. Participants don't have to do the whole trail as there are smaller sections to choose from. Visitors to Knysna can spend many happy ours at the lakeside investigating the shoreline, observing prolific birdlife and resident marine creatures. The tiny Knysna Seahorse lives amongst the seaweed, skilfully blending in with its surroundings sustained by the tranquil waters of the lagoon. The estuary of the Knysna River provides an excellent place to view waders in the summer months. Grey Plover, Greenshank, Curlew Sandpiper and Whimbrel are prominent view points in the Knysna Lake Area. In winter the lagoon harbours some non-migratory larger species like Egrets, Gulls, Cormorants and Ibises. The threatened African Black Oystercatcher is present all year, but their numbers increase in winter to what is regarded as a globally significant population. Cape Shoveller, Avocet and Blackwinged Stilt are also present in good numbers. 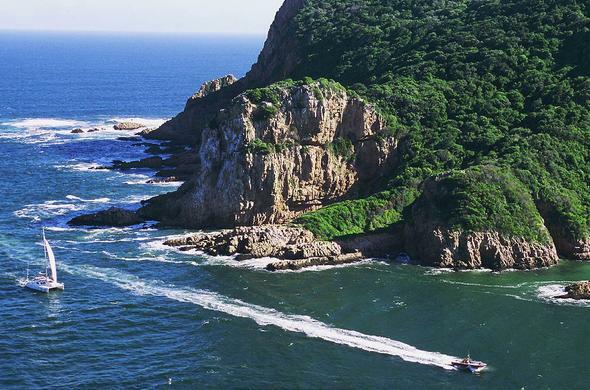 Knysna is a major attraction on the famous Garden Route and has much to offer visitors. The bustling town has a full array of cafes, shops, restaurants, galleries and craft centres. Annual festivals and sporting events draw many enthusiasts who enjoy the relaxed lifestyle and great amenities. Spot birds like the Black Oyster Catcher in the Knysna Lake area, which is part of Garden Route National Park in South Africa.